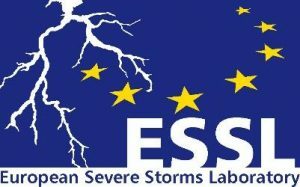 The European Severe Storms Laboratory (ESSL) is a non-profit research organisation which focuses on severe convective storms. We are based near Munich in Germany and in Wiener Neustadt, Austria, where we offer training courses to forecasters and organise the ESSL Testbed, an annual event with the aim of enhancing severe weather forecasting across Europe. ESSL is legally an association of which 18 European meteorological services are members. 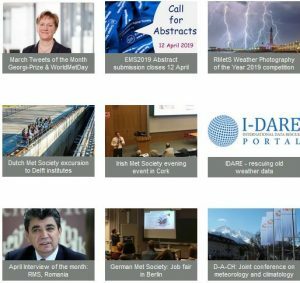 The first step towards founding ESSL was taken at the Conference on European Tornadoes and Severe Storms in Toulouse in 2000, where many scientists from across Europe presented reports on severe storms that had occurred in their respective countries. At the time, many still considered tornadoes or very large hail to be unpredictable “freak events”. However, the participants of the conference detected patterns in their occurrence and realised that they happen all across Europe. Because a pan-European approach was required, researcher Dr. Nikolai Dotzek and six other scientists decided to found ESSL in 2006. Figure 1. Projection of severe thunderstorm environments based on 14 EUROCORDEX models (see also Púčik et al., 2017). Image credit: ESSL. An important pillar of ESSL is the European Severe Weather Database (ESWD). It contains over 140,000 reports of phenomena like large hail, flash floods, severe wind gusts and tornadoes, collected by ESSL and its network of volunteers across Europe. Data from ESSL have been used in over 80 peer-reviewed publications and has become an important resource for scientists. ESSL’s research has focused on studying the meteorological conditions that give rise to severe weather events. This supports the forecasting of such conditions and the prediction of the effects of climate change on severe convection. 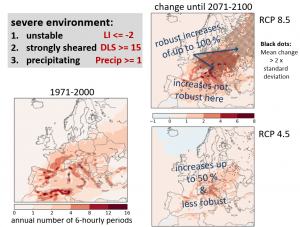 In a recent ESSL study, we reported that the consensus of 14 regional climate models is that severe storms will become more frequent over a large part of Europe by 2100 (Figure 1). Besides research work, we also offer training courses to forecasters and organise the “ESSL Testbed”. At the Testbed, forecasters from around Europe use new tools and products to make experimental forecasts. Such tools include novel visualisations of convection-permitting model ensembles and new satellite and radar products for detecting severe weather. The Testbed participants provide valuable feedback to tool developers. Our training courses and the Testbed are becoming more and more popular. A top priority right now is to provide training tailored to the aviation forecasting community. We are also developing new forms of training in cooperation with EUMETNET, such as remote on-the-job training. The Meteosat Third Generation programme is becoming very important for the ESSL Testbed, as these satellites will be launched a few years from now. With the Testbed, we support the development of products based on new sensors, such as the hyperspectral sounder or the lightning imager, and prepare forecasters for using them. Another top priority is improving the collection of severe weather reports by crowd-sourcing. We have developed a standard for collecting and sharing such data with the European Weather Observer (EWOB) app (search for “EWOB” to find the respective app for your operating system). We are working with weather services to set up an international exchange of nationally-collected data. For a grass-roots independent research organisation like ESSL, it is difficult to raise sufficient funding to operate. Most importantly, covering operating expenses such as rent and administrative work is hard, because externally funded projects such as those funded by governments or the EU typically only cover expenses immediately related to the research, primarily the salaries of the researchers involved. Another major source of income for ESSL is membership fees; these are needed to sustain the quality control work for the severe weather database ESWD rather than operating expenses. Over the past years, ESSL’s budget balanced because some of its employees were able to work on the testbed and the training courses as researchers. Recently, the financial situation has become more difficult because a number of research projects have ended and there is no guarantee that project proposals that are under review will be successful. If this difficult situation can be overcome, it is important that ESSL becomes less reliant on project income. Expanding training activities is one way to accomplish that. Membership fees, in particular those from national meteorological services, contribute only 3% of the total annual income (Figure 2) and will need to be reviewed at the upcoming ESSL General Assembly. Figure 2: ESSL annual income shares (left) and division of income from membership fees. Image credit: ESSL. To find out more about ESSL please visit www.essl.org, where one can subscribe to our English-language Newsletter, register for training courses and workshops, read our publications, and find out how to support the collection of severe weather reports.